THE dream is over, but it was great while it lasted; and Lincoln City, currently top of English football’s fifth tier, are still the first non-league team to reach the quarter-finals for 103 years. Last Saturday was their biggest test yet, the might of Arsenal at the Emirates; and sadly the Imps lost 5-0. 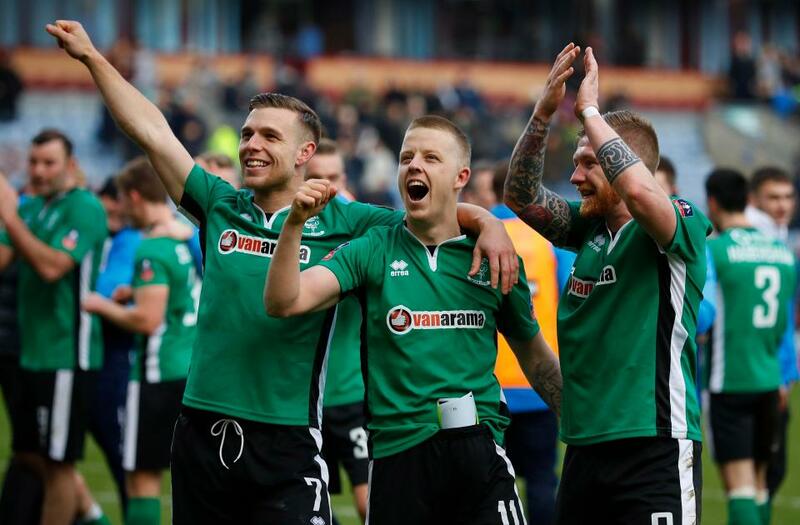 Lincoln City are now back on familiar turf and focusing on their push for promotion from the National League to League Two; and we’re helping the players to stay in tip-top condition by keeping them hydrated. We make regular visits to their Sincil Bank home to drop off supplies of bottled water bottles for their water coolers, as well as our 500ml sports bottles which the squad uses for their home and away games. There’s only another 11 games left for Lincoln, and at the moment they’re in a very commanding position; so come on you Imps! If you’d like to know about any of the bottled water products that we supply to thousands of businesses across Lincolnshire and Yorkshire as well as Derby and Nottingham, you can call us for free on 0800 0612193, or take a look at our website. And did we mention that we also supply boxes of fresh fruit? Yep, fresh fruit collected early every morning from Hull fruit market.